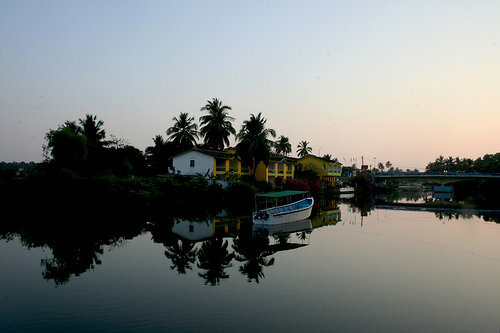 The Baga river flowing on one side of the beach gives a pleasant diversion especially for honeymoon holidaying in Goa. However, water is ripping at the mouth of the river where it meets the sea. Enjoy the music as water crashes on the rocks. Baga River has its source at the dense mixed jungles of Assagao and Bardez. This 10 km long river system, rich in aquatic species, is a haunt for the fishermen. At Baga, there is a strange box-bridge nicknamed as ‘The Coffin Bridge’ across the river. This river separates the lush paddy fields on the south from the settlements on the north. The river flows along the sides of Baga beach and finally falls into theArabian Seaat Baga. At the confluence of the river and the sea, there is a group of black rocks making an enchanting view of the nature. Baga River is the best place here to trip around by yacht or speed boat, especially at the point where the river meets the sea. The river mangroves and exceptional eco-system is worth visiting.